ER Editor: We also recommend the article by Saeed Saeed titled Does the cultural boycott of Israel work? 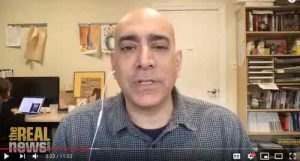 Ali Abunimah discusses a leaked report from Creative Community for Peace (CCFP), a front for Israel government-backed lobby group StandWithUs, which admits the cultural boycott is “constantly growing” and “innovative”. As the campaign to boycott Israel for Palestinian rights is growing internationally, even pro-Israel lobby groups are secretly admitting on the inside that the boycott tactic is effective. A new confidential report from Creative Community for Peace, CCFP, which is a Los Angeles-based pro-Israel lobby organization that targets the entertainment and art industry, a leaked report from this group reveals that the cultural boycott against Israel has an even deeper impact than was previously recognized. The CCFP was recently exposed by the progressive organization Jewish Voice for Peace to be a front organization for Stand With Us. Stand With Us is a staunchly right-wing pro-Israel lobby group that is, in fact, partially funded by the Israeli Ministry of Strategic Affairs, so it receives money from the Israeli government. And CCFP, its goal is to attack and organize smear campaigns against artists who participate in the cultural boycott of Israel. So joining us to talk about what this means for the International BDS, Boycott, Divestment, and Sanctions, movement against Israel is Ali Abunimah. Ali is co-founder of the award-winning online publication The Electronic Intifada, and he’s the author of One Country and The Battle for Justice in Palestine. Thanks for joining us, Ali. ALI ABUNIMAH: Thank you, Ben. BEN NORTON: So, Ali, can you walk us through who CCFP is, and specifically what its links are to Stand With Us? These are right-wing, pro-Israel lobby organizations. Can you explain to the viewers what the cultural boycott is, and why these groups are so aggressive against the cultural boycott? ALI ABUNIMAH: CCFP, Creative Communities for Peace, poses as a sort of a nonprofit peace group that tries to counter the cultural boycott of Israel by telling artists who have been approached by Palestinian rights campaigners and asked not to go to Israel, then CCFP steps in and tries to tell them, you know, music is the universal language, and dialogue is better than boycotts. And so it tries to give this soft, you know, lovey-dovey image that it’s a peace group, and that it just wants everyone to come together in peace and love. The reality, as you’ve mentioned, is that it’s a front for Stand With Us. Now, Stand With Us is a far-right pro-Israel group that a few years ago, the Prime Minister’s Office in Israel, the office of Benjamin Netanyahu, decided to fund directly in order to do propaganda for Israel. Now, it’s not clear if that funding ever went through. It was widely reported that the funding was awarded, but then Stand With Us subsequently denied ever receiving the funding. But nonetheless, Stand With Us is part and parcel of the network of propaganda organizations that work closely with the Israeli government to spread an anti-Palestinian message and try to sabotage and thwart the nonviolent Boycott, Divestment and Sanctions movement. BEN NORTON: Now let’s look at the specific report. This report, that was a confidential report from CCFP and has been cited by Jewish Voice for Peace, it really clearly spells out the organization’s politics. One of the things that the report does is condemn intersectionality, which is the idea that multiple systems of oppression are linked together. And specifically the report is very critical of the fact that there are a lot of civil rights organizations and black American organizations and feminist groups in the United States that are increasingly in solidarity with Palestine. In fact, CCFP describes the growing black Palestine solidarity and the growing feminist support for Palestine as a, quote, “troubling and growing trend.” So it’s very clear that this is a right-wing organization. So can you talk about why this report was confidential, and what CCF has to hide? ALI ABUNIMAH: Right. Well, there’s a couple of really important things that need to be kind of teased out. One is the observation–which is not unique to CCFP. Other Israel lobby groups, and in fact the Israeli government, have said very clearly time and again that they view growing black solidarity with Palestine to be a real threat to their efforts to shore up support for Israel in the United States. Why? Because black support for Palestine is rooted in such historic struggles; the identification was the Palestinian struggle based on the black struggle for liberation from American state racism, apartheid, and Jim Crow, and of course the anti-apartheid struggle in South Africa. So Israel fears that black support not only widens the base of support for Palestinians, but gives the Palestinian cause much more progressive credibility. That’s exactly what the CCFP report is saying. But you’ll remember, Ben, that the recently-leaked Al-Jazeera film on the Israel lobby, in that film you hear an Israeli official saying the same thing, that Black Lives Matter is a threat. Now, where this really concerns CCFP is that, because they’re intent on fighting cultural boycott, is that they see many black cultural figures really being in the forefront of speaking out on Palestinian rights. And that’s artists in the hip hop community. It is also not just in music, but also in sports. We’ve seen NFL players refusing to go on propaganda junkets to Israel, or speaking out for Palestinians. So they fear that black support for Palestine combined with the willingness of black cultural figures to speak out is really something very dangerous for Israel’s efforts to whitewash its apartheid regime. BEN NORTON: Yeah. And then finally can we talk, maybe, about some of the specific performances and cancellations from artists that CCFP have targeted? This report cites a few different incidents, including the German pop culture festival. They also talk about a dance group called Batsheva. But we’ve also seen that in the past CCFP has really gone after artists like Roger Waters, and other pop stars who have canceled performances in Israel. Sometimes these artists, like Roger Waters, have explicitly done so in support of Palestinian rights. Sometimes other artists, like Ariana Grande and others, have not necessarily said it was because of the conflict in Israel-Palestine and the illegal occupation of the Palestinian territories, but it’s clear that that was one of the reasons they canceled. So maybe can you talk about some of the specific artists that CCFP has targeted? ALI ABUNIMAH: Yeah. Well, over the past year in general we’ve seen a massive growth of the cultural boycott. We saw, you know, just over a year ago we saw Lorde, the New Zealand pop star, cancel a performance in Tel Aviv, which was huge international news. In the past year we’ve seen Gilberto Gil, we’ve seen Shakira, and other big names refusing to go. And you mentioned the German pop culture festival, where a number of bands refused to participate for the second or third year running in that festival because of sponsorship from the Israeli government. And we’ve seen literally hundreds of independent artists and bands and deejays stating publicly that they will abide by the boycott. All this has happened in the last year. Now, what’s significant is Israel has really tried to thwart this through a carrot and stick approach. The carrot is offering artists very large paydays–and of course, also, Lana Del Rey canceled recently, despite reportedly being offered a massive amount of money to go and play at the festival in Israel. But she canceled after a campaign. So that’s the carrot approach, is offering large paydays for these artists. And the stick is to really smear them and go after them, as has happened to Roger Waters, where there have been efforts to prevent him from performing in public stadiums, or to have his shows canceled, or just generally to smear him. But what this report shows is that neither approach is working, neither the carrot nor the stick. And the report says very clearly that this, what they call the ‘silent boycott,’ is growing. You mentioned Ariana Grande and others, where they just refuse to go to Israel. They don’t necessarily come out with a statement saying, you know, I’m taking a stance in solidarity with the Palestinians. They just view Israel as toxic. They don’t see it worth the the public relations nightmare. Or perhaps they even agree with the view that Palestinians should have full human rights, but they just don’t want to say it. But for whatever reason, the silent boycott is seen by Israel as really an even bigger threat than, let’s call it, the vocal boycott. And this was something that was also stated very clearly and explicitly in another leaked report which was written by the ADL, the Anti-Defamation League, and the Israeli think tank the Reut Institute that also leaked last year, and was published by the Electronic Intifada, where they said clearly that they view one of the biggest threats and one of the fastest-growing threats to be the silent boycott. And by the way, that silent boycott is not just in terms of culture and music and art, but also academia and scientific research, as well. BEN NORTON: We’ll have to end our conversation there. We were speaking with Ali Abunimah, who is an award-winning journalist and the co-founder of the Electronic Intifada. He is also the author of One Country and The Battle for Justice in Palestine. As always, thanks for joining us, Ali. ALI ABUNIMAH: My pleasure. Thank you, Ben. BEN NORTON: For The Real News Network. I’m Ben Norton.